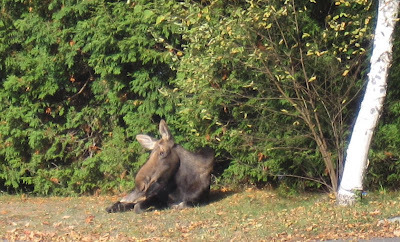 Breaking Adirondack Moose News - Give The Girl Some Space! Despite appearances, the calm cow moose pictured here thoughtfully ruminating about her existence, created quite a ruckus today in the Village of Lake Placid. Placid's placid guest has grown accustomed to relaxing in the Village, not far from the shore of Lake Placid. The Village and surrounding region is busy with visitors enjoying the incredible weather, sights, and activities, so she attracted a large crowd. The resident moose whisperer was called to assess the situation. Since she has not bothered anyone to date, and seems to prefer a low-traffic, quiet part of town, the decision was made not to relocate the 600-pound beauty. She did however, display aggressive behavior toward a local policeman who got a little too close for her tastes when he tried to "shoo" her. Seeing moose like this in the Adirondacks is a new phenomena. There has never been a time when the human population and the moose population have been concurrently this high in the Adirondacks. Moose had almost disappeared from the Adirondacks by the turn of the 20th Century. But now they are the new come-back kids, so we all have to learn new behavior. Because, although they appear calm and easy-going, moose are not friendly, they are just unafraid. They are huge and can take care of themselves, and they know it. Most people do not realize that moose are aggressive and are considered more dangerous than grizzly bears. When a moose feels threatened, it will attack. A male moose in the rut is someone you want to avoid at all costs. Ed, the resident biologist and moose whisperer is quite serious when he says people should stay at least 200 feet away from a moose of any kind. It makes perfect sense to me, but some of today's wildlife aficionados didn't get it, so a New York State Department of Department of Environmental Conservation Officer is stationed near Mrs. Moose, for everyone's protection.